Oh Dear, Oh Dear, Oh Dear...or as Gilbert and Sullivan would say... “a policeman’s lot is not a happy one.” And having watched a press preview of Les Misérables last night it would be difficult to find an unhappier man then Javert played by Russell Crowe. But he should not be criticised for that because although it’s fifty years since I last read Monsieur Hugo’s book the admirable press notes explained all about Javert’s progress from the slums to his pursuance of law and order with an enthusiasm which bordered on obsessiveness. We will return to Javert later. This was a stunning film; it lasts for 2 hours and forty minutes but felt to me like one-and-a-half hours. The downside of a long film though is that the modern audience and bladder seems incapable of remaining seated for that length of time so that there were many unfortunate interruptions. Again though, it wasn’t until the end that you realised that you’d just sat through nearly three hours of singing with barely any spoken words - it was nearly all “through-sung” rather than spoken dialogue. Those marvellous press notes had added to the enjoyment as I realised that the opening scene of Jean Valjean was shot in our very own shipyards at Portsmouth. Then suddenly Monsieur Valjean is doing his own version of Julie Andrews popular sing-a-long as he runs over the hills of the south of France to celebrate his new-found freedom before he once again becomes an enfant terrible and gives Javert his raison d’être. All the performances were worthy of note but stand out ones were from Eddie Redmayne as one of the young lovers plus two great cameo parts; one from one of our younger national treasures - Helena Bonham Carter ably assisted in acting, pick-pocketing and all-round bad behaviour (hooray) by Sacha Baron Cohen. To return to Russell Crowe - do we expect too much from him? And just because Javert is French do we really want a modern day Inspector Clouseau? Do not forget that in simple terms, Javert is the baddie in this tragedy so I suspect Russell Crowe did exactly what Monsieur Hugo would have wanted; he plodded (ooops) around with all the cares of the world on his back and because of his upbringing he found it impossible to believe that Jean Valjean had turned over a new leaf and so he jumped off a high building. There was much mention in the notes of getting into the right mindset; of Russell Crowe’s 28 block walk in the pouring rain to his audition, of Anne Hathaway’s decision to have her own hair chopped off and to lose 25 pounds in weight over five weeks, of Samantha Barks’ almost rags-to-riches part having come third in the “I’d do anything” show to get a part in Oliver!...and what an excellent performance she gave as well. All of this I went towards ensuring the success and enjoyment of this spectacle. 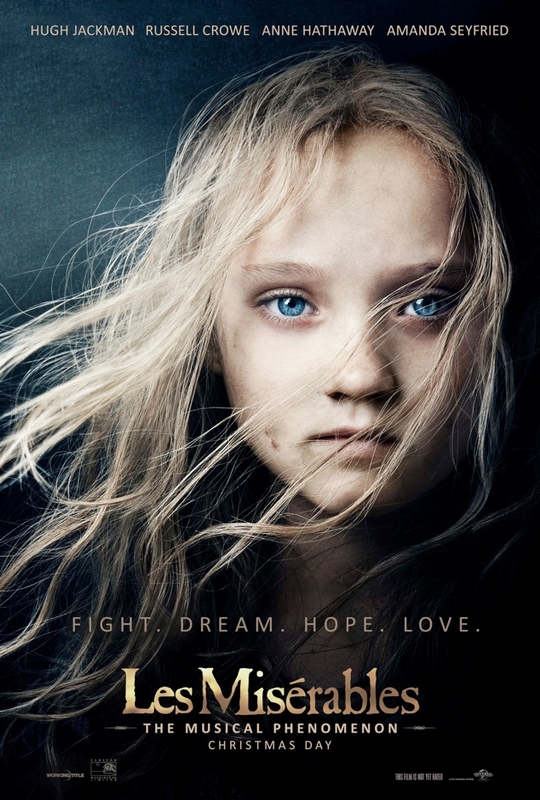 When it’s released you really should go and see it but remember, Cameron Mackintosh and Tom Hooper didn’t just film the theatre musical - this is Victor Hugo’s classic work reinterpreted as a real cinematographic production. have found a website which has a version of the script. It seems there are a lot of lyric changes or spoken lines. How much would you say is like the original stage show?